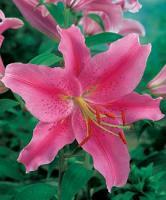 Acapulco Lily and all other varieties of Lilies are available for wholesale purchase. Lilies are one of the most impressive, sturdy and versatile flowers used in floral designs and weddings. Known for their fragrance and large bloom size – They come in shades of purples, lavenders, pinks and white. Lilies come as a single stem with several blooms and buds at the top of the flower. The length of Lilies varies depending on the variety, but they can be cut down or left long depending on their usage. All varieties generally come in with the bloom closed and are available readily throughout the year – with the highest availability in the spring and summer months . We recommended processing them 2 to 3 days before use in order to allow the bloom to open and hydrate. Average vase life of Lilies are around 5-10 days. We import Lilies from Holland, Ecuador and Columbia – and when in season, we buy from local farms in the United States. Wholesale Lilies are sold in bunches of 10 stems or by the box. Lilies should be kept in a cool area for storage, or left at room temperature to allow to hydrate before use. We can accommodate special orders of bulk quantity of a specific color, please give us 10 days notice – often we can accommodate last minute orders as we keep many varieties in stock. We specialize in selling wholesale Lilies for weddings and special events, please contact us for more information.